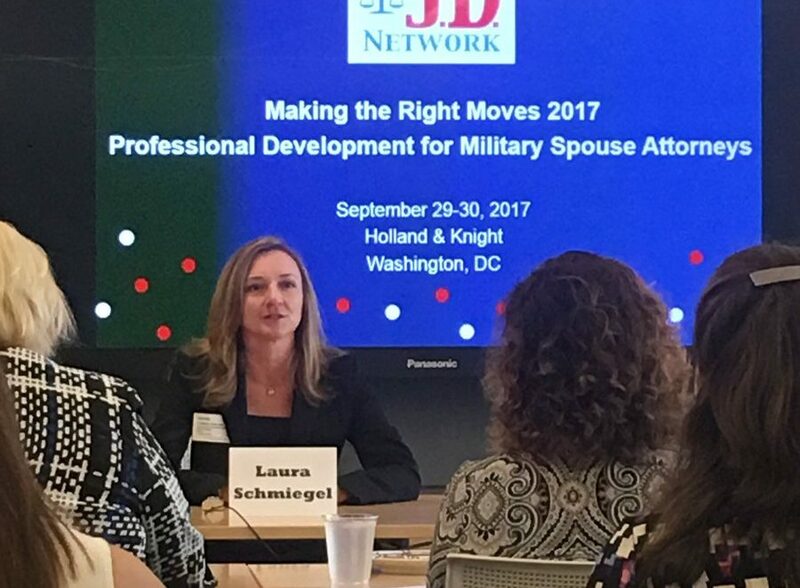 Making the Right Moves (MRM), MSJDN’s annual professional development conference, took place this past Friday and Saturday. New this year was a members’ retreat on a second day providing plenty of time for building connections. 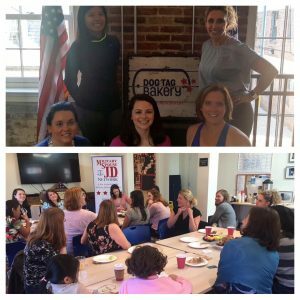 Approximately 50 MSJDNers attended, traveling from places near and far, including D.C., Maryland, Virginia, North Carolina, Florida, New Mexico, and California. 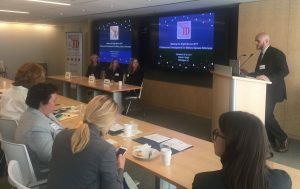 The employer panel was followed by an interactive workshop about effectively telling your professional story led by Andrea Templeton, Lynn Waidelich, and Laura Winthrop Abbott of the Other Side of Service. They explained why telling our professional stories as military spouses can be challenging. Not only is the direction of our career paths not always clear, we also don’t necessarily have the opportunity to practice telling the story. Participants were given time to develop a theme tying their various jobs together and and then compose and practice a brief “elevator speech” on their professional selves. Lunchtime included the presentation of the Volunteer Service Award to Bobbie Collins and the Exceptional Service Award to Angela Allen. In her remarks, Bobbie challenged attendees to find ways to use their skills to give back to our legal and military communities. 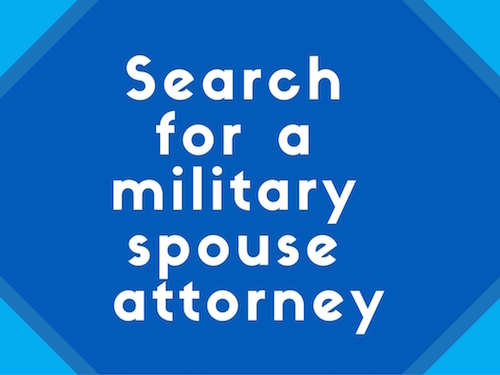 Angela was unable to attend but sent a video message to her fellow military spouse attorneys. 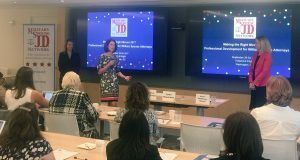 Attendees also heard from Meg O’Grady with Platinum Sponsor Kaplan University, who shared her own career journey as a military spouse, as well as her work with Concord Law School, recently acquired by Purdue University and working to become the first ABA accredited online law school. Wrapping up the lunch hour, Cheri L. Cannon, managing partner at Tully Rinckey, shared her career experiences and noted that Tully Rinckey is a military spouse friendly firm and are hiring! The afternoon programming started with a CLE presentation by Karen Dalheim from the DoD Standards of Conduct Office and U.S. Air Force Lt. Col. Reggie Yager exploring the boundaries of political engagement for military spouses and servicemembers. The afternoon continued with an interactive networking workshop led by Adrianna Domingos-Lupher and Elizabeth O’Brien of Hiring Our Heroes. 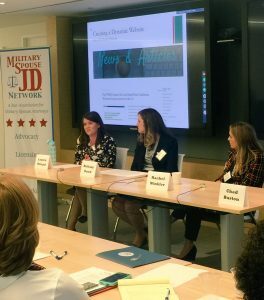 They discussed the changing face of networking and personal branding, and best practices for military spouses to leverage LinkedIn to find work. The final panel, moderated by MSJDN board member Lindsey Wisniewski Savage, discussed a variety of creative ways in which to “PCS proof” your career. The speakers included Brittany Dowd, who co-foundedAd Hoc Legal Group, a virtual practice offering project-based legal services, with fellow MSJDN member Laura King. Lauren Roland talked about her experience creating a fully remote position out of a brick-and-mortar job at a regional bank headquartered in North Carolina. Rachel Winkler, an immigration attorney at Frontier Solutions, discussed her experience negotiating numerous full-time remote positions throughout her career. The panel also included a telephonic presentation by Chad Burton, the CEO of CuroLegal. Chad discussed his company’s work developing tools for bar associations and law firms to both modernize small firm and solo legal practice and to facilitate getting legal services to consumers. CuroLegal worked with the American Bar Association to develop ABA Blueprint, which includes small and solo practitioners to start and run a modern practice. Chad talked about what it means to practice law as a modern attorney with a mobile practice and was emphatic about dispelling the stigma that attorneys who work virtually remotely are not “real” attorneys. The formal part of the day ended with amazing board members talking about what MSJDN does for its members and how to get involved in MSJDN: Libby Jamison (MSJDN president), Alex Spisak (Homefront to Hired chair), Allison Chersicla (events chair), Karen Scanlan (state licensing chair), Dawn Gile (membership director), and Alyn Beauregard (treasurer). Check out the links to the MSJDN website at the end of this article for more information and contact information! The end of the conference’s formal agenda on Friday was the beginning of the member retreat. Participants mingled with friends, both old and new, at a happy hour on Friday evening. On Saturday, the member retreat officially began with a 7:30 a.m. yoga class and 9:00 a.m. breakfast at Dog Tag Bakery. It continued with sightseeing around D.C., a photo op at the U.S. Supreme Court, and an informative private tour of the Library of Congress. The event closed with a tour of military art exhibit and happy hour at the National Portrait Gallery. Many thanks to the hard-working organizers and enthusiastic participants for making MRM 2017 a smashing success. If you were unable to join us this year, please consider participating in this amazing annual event in 2018! Looking for more information – visit the MSJDN website! Looking for a job? Look for hiring opportunities with MSJDN Homefront to Hired partners and on the Jobs Board. If you’d like more information on Homefront to Hired, contact board member Alex Spisak at homefronttohired@msjdn.com. Looking for discounts? Check out the discounts section of the website. MSJDN has negotiated a variety of discounts on CLEs, bar review courses, bar associations, LinkedIn and more. Contact Dawn Gile at membership@msjdn.org for more information. Looking for professional inspiration? Check out the MSJDN blog and the press page for MSJDN-ers’ professional stories. Contact Johanna Thibault at communications@msjdn.org if you are interested in writing for the blog or newsletter. Contributions are always welcome! Looking for pro bono opportunities? Check out the MSJDN Justice for Military Families program, which has a partnership with the Tragedy Assistance Program for Survivors (TAPS). Contact jmf@msjdn.org for more information! Are you interested in serving on the MSJDN Board in 2018? Contact board@msjdn for more information!